This graph shows the global vegetable production in 2017, broken down by type. In that year, approximately 182 million metric tons of tomatoes were produced worldwide. The term vegetable refers to an edible part of a plant which can be consumed raw or cooked. Eating vegetables is beneficial to one’s health—they are the main sources of nutrients such as vitamins A and C, potassium, folic acid and dietary fiber. Dietary fiber from vegetables aids in reducing cholesterol levels, lowers the risk of heart disease and is also essential for digestion. People who consume more fruit and vegetables as part of a healthy and balanced diet are more likely to reduce the risk of several chronic diseases. In 2014, maize was the most commonly produced vegetable worldwide, contributing over 1.04 billion metric tons to the global vegetable production. That year, Asia accounted for more than three-fourths of the world vegetable production. In 2013, China was the largest producer of fresh vegetables with a production value of approximately 25.25 billion U.S. dollars. Other leading vegetable-producing countries include India, Vietnam, Nigeria and Philippines. In the United States, California was the largest producer of fresh market vegetables in 2014. The state also produced around 14.15 million tons of principal vegetables for processing during the same period. In 2016, store sales of packaged salad in the U.S. averaged 4,017 U.S. dollars per week. 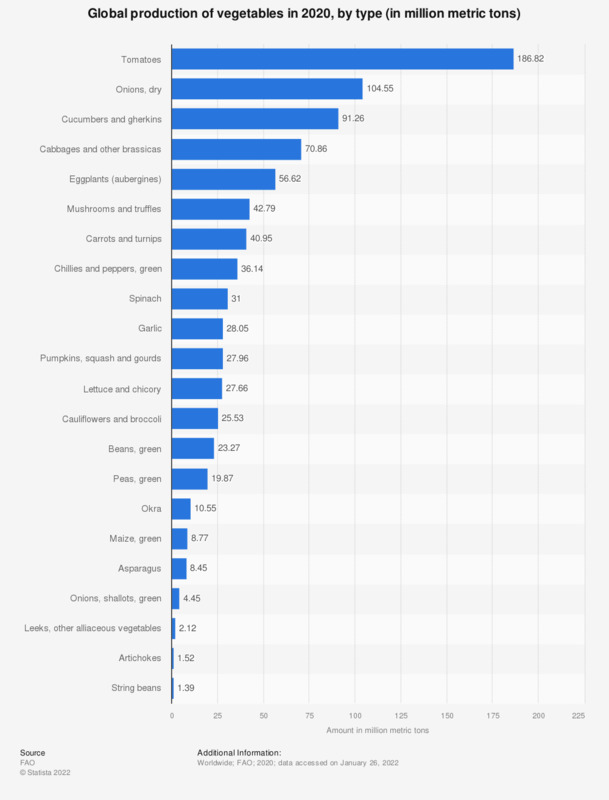 Tomatoes were the second most sold vegetable produce category, followed by potatoes and other cooking vegetables.